Everyone knows the importance of roof insulation, especially if you live in areas of extreme temperatures – hot or cold. Roof insulation can drastically reduce your Atlanta heating or air conditioning needs, which will save you money and help the environment by reducing the amount greenhouse gasses released, not to mention keeping you and your family more comfortable. Upping the ante on your Atlanta home’s roofing insulation will cost you a little up front, but the amount of money you save in heating and cooling costs will quickly offset your investment. Most people are familiar with the old standby, fiberglass insulation. Typically produced in rolls or “batts,” these fiberglass materials can cause itchy skin and respiratory irritation. The production process of fiberglass insulation is distinctly NOT environmentally friendly and often uses cancer-causing chemicals including formaldehyde. Fiberglass insulation is fire-resistant (a good thing) but when it does burn, it releases a number of toxic substances. So what other roof insulation options do you have, that may be better for you, your family, and the planet? 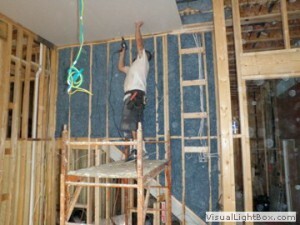 There are several available now and more new “green” insulation technologies being developed currently. Recycled cellulose fiber is made from old newspaper, cardboard, and a variety of other post-consumer recycled paper products. This product is typically sprayed into the attic of the home or it may be purchased in sheets. This product has significant insulating properties, so it will save you more money than traditional fiberglass batts. In addition to being a very green roof insulation option, cellulose fiber insulation is treated with a very effective (and typically environmentally friendly) fire retardant that may actually slow the spread of fire. This product also has sound dampening qualities to cut down on outside noise and it is treated with a product that deters mice, rats, and other such vermin that like nesting in your attic. This product is slightly higher in cost but yields much higher energy savings. Remember that favorite pair of blue jeans you had in high school? Wouldn’t it be awesome to know your old stand-bys are now keeping some nice family comfortable? Denim and other cotton products are now being repurposed as roof insulation. Much like cellulose insulation products, recycled cotton insulation comes in rolls, making it much easier to do DIY installation in your attic. This product is soft and doesn’t irritate skin or respiratory systems (much like your old jeans!). This product is also resistant to fire and vermin, and is an excellent sound barrier. The insulating properties of recycled denim are excellent as well. Recycled denim insulation is typically composed of about 80% recycled materials. Roof insulation made from soy is a relatively new addition to the green roof insulation scene. This product is made from soybean oil and is applied using a spray-in technique. Once there, it expands like foam to fill in air spaces and cracks. It then hardens into a product that provides a superior level of insulating properties. This product has a very long life, typically as long as the building into which it is applied. It’s pretty expensive, but sheep’s wool provides the best insulating properties available, especially in the environmentally friendly range of products. It’s sustainable, environmentally friendly, and naturally resistant to fire. This product is particularly green, because the process to produce it uses the least amount of energy of all insulation options. Sheep’s wool has natural moisture-resistant properties, so it is an excellent option in wetter climates. This product uses a mechanical production process and consequently, no adhesives have to be used – an added “green” bonus. It has a long life, it can be reused easily, and – when you’re done with it – it can be made into compost for your garden. This product is an excellent value both for your wallet and for the planet. The bottom line is that you DO have many options if you seek a more environmentally friendly roof insulation product. Consult your Atlanta insulation specialist about the various options available to help determine which is best suited to your needs.